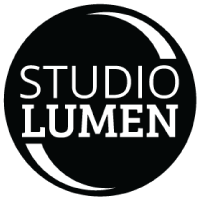 BTS with Us, means, Behind The Scenes with Studio Lumen. This is tentatively a series highlighting some things we do to make you guys look as good as possible, or anything else that's interesting here at the studio. I reserve the right to change the name on a moment's notice! For today's post, I thought I'd share the lighting components that make up our professional headshots. We recently realized how much each light is contributing to the shots, and yet when deconstructed, they don't all seem to be contributing much. I'll start with the final image, slightly retouched (white balance, contrast, brightness, and the background clearned up - we usually do more for clients), then go through each light alone, followed by building the light from front to back. Our lovely model Gillian was happy to pose (or was she really? Not so sure) for this portrait series. We call it: Lady with Tea. Here's the fully lit and worked up image. The main light provides the bulk of shaping on the front of the subject. It is a soft-ish light, but must be fairly directional and not too big to achieve the shape we want. Tea Lady is working hard to maintain the same expression between photos. The fill light fills in the dark shadows produced by the main light, under the eyes, nose, and chin. It is a very large soft light source, quite close to the subject, and much lower than the main. Tea Lady is disappearing. These are the lights that provide the separation of the subject from the background. They also make hair look amazing, and define the edges of the face. They are surprisingly effective! Tea Lady is almost gone without Main and Fill. These fill in any gaps in the white background. We later remove any gray areas left, to ensure the subject is truly on a fully white background. Without the rest of the lights, you can't make any of Tea Lady's features out. You notice the dark shadows that were beneath Tea Lady's nose and chin, from the main only photo, have been eliminated, but there is still some nice shaping to the face. Tea Lady has good cheek bones, and kind of looks like Faye Dunaway. Notice how Tea Lady's hair now looks better, the edges of her shoulders are defined, and there is a nice edge to her face on the left side of the image. The lighting on Tea Lady is now complete. The background is slightly gray in the corners, but around the subject it is bright enough for our post-production purposes.